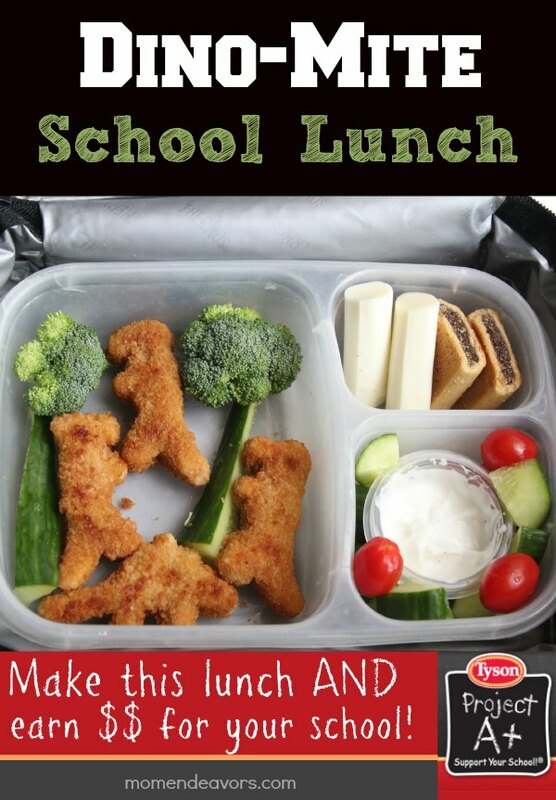 A new school year may have you struggling to come up with good school lunch ideas, but as part of a sponsored post for Collective Bias® I’m sharing a dino-mite lunch idea that your kids and your kids’ school will love! It’s obvious fun for the kids and because of Tyson’s Back to School Project A+ Program, it earned Big Brother’s school $.24! Big Brother loved his dino-themed lunch! It was super easy to make with Tyson’s Fun Nuggets! We actually made some earlier in the week for a quick dinner and I knew the leftovers would be perfect for one of Big Brother’s lunches. He doesn’t mind eating the chicken nuggets cold (or at least not warm anyway), so they worked perfectly for a school lunch box idea. 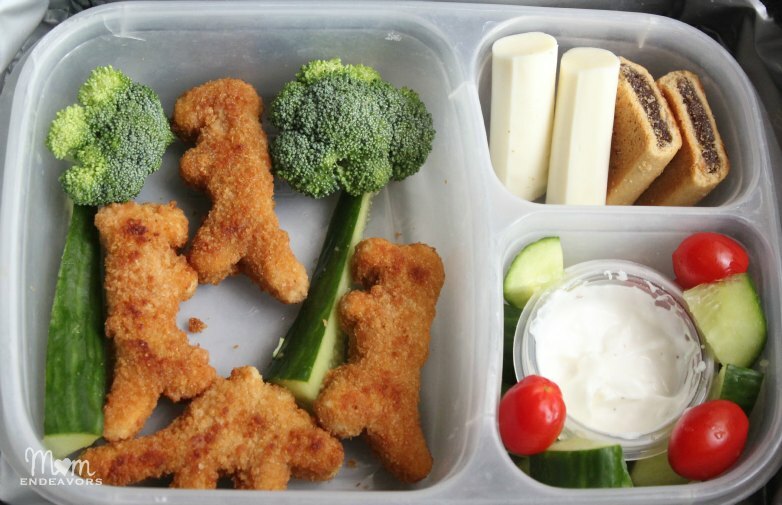 I put them in the “Bento” container first, then added some “dinosaur trees” (cucumber sticks & broccoli). Yum! And, thanks to Tyson’s Project A+ Program, Big Brother’s school gets money for our Tyson purchases! The process is simple, when you’re out shopping you can look for participating Tyson products (there are a lot!!). You can see our entire shopping trip on Google+ here, but the idea is simple… you just look for Tyson products with the A+ label. On the back of those packages, you’ll also find a label to cut out, like this: Every label clipped can be redeemed for $.24 for your school! That might not sound like a lot, but it actually is quite a bit more than many of the other similar label redemption programs. Plus, just think if every kid at a school sent in just one – at most schools around here, that would easily add up to over $100 to be put to use by the school. Big Brother doesn’t go to a traditional large public district school, so it’s nice to be able to contribute in an easy way. 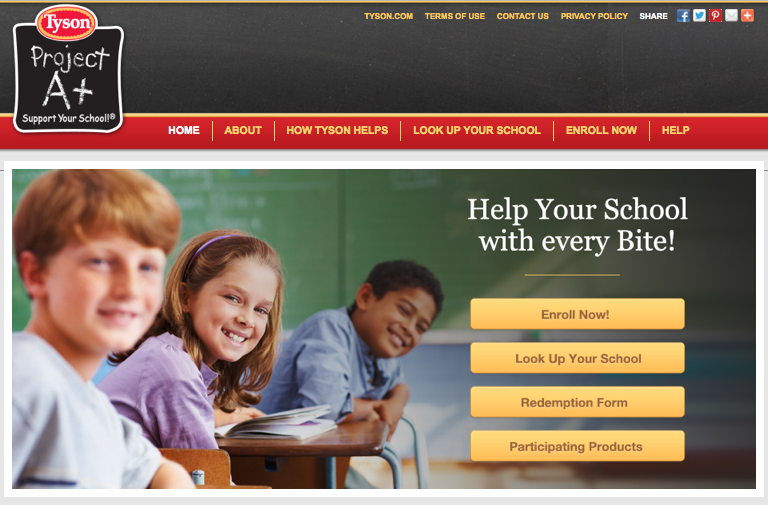 To see if your school is enrolled, just head over to the Tyson Project A+ Website. There, you’ll be able to look up your school. If it’s not there, you can actually enroll your school. The site is easy to navigate- you’ll find 4 easy buttons to look up your school and/or enroll, plus find the list of all the participating products! Amazingly, Big Brother’s school and just two others in that zip code (out of probably at least 10-20) are already enrolled! Excellent! I’m glad to have an easy way to give back to his school for something we buy anyway. Tyson chicken nuggets are our favorite and I like having some of the Tyson Grilled & Ready® chicken products on hand as well for quick meal options. So, we’ll be cutting those labels and earning almost a quarter each time for his school! Did you know about Tyson’s Project A+ Program?